^ a b Hewsen, Robert H. Artaxata. Iranica. Accessed February 25, 2008. 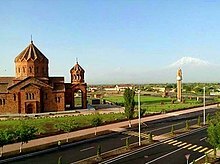 ^ a b c （アルメニア語） Tiratsyan, Gevorg. «Արտաշատ» [Artashat]. Armenian Soviet Encyclopedia. Yerevan: Armenian Academy of Sciences, 1976, vol. 2, pp. 135-136. ^ （アルメニア語） Movses Khorenatsi. Հայոց Պատմություն, Ե Դար. Gagik Sargsyan (ed.) Yerevan: Hayastan Publishing, 1997, 2.49, p. 164. ISBN 5-540-01192-9. ^ a b c ブルヌティアン 2016, p. 60. ^ Garsoïan, Nina. "The Emergence of Armenia" in The Armenian People from Ancient to Modern Times, Volume I, The Dynastic Periods: From Antiquity to the Fourteenth Century, ed. Richard G. Hovannisian. New York: St. Martin's Press, 1997, p. 49. ISBN 0-312-10169-4. ^ a b c 中島 & バグダサリヤン 2009, p. 34. ^ a b c ブルヌティアン 2016, p. 66. ^ ブルヌティアン 2016, p. 91. ^ ブルヌティアン 2016, p. 100. ^ ブルヌティアン 2016, p. 101. ^ a b ブルヌティアン 2016, p. 102. ^ 中島 & バグダサリヤン 2009, p. 43. ^ a b 中島 & バグダサリヤン 2009, p. 44. ^ ブルヌティアン 2016, p. 106. （ロシア語） Arakelyan, Babken N. "Основные результаты раскопок древнего Арташата в 1970-73 гг.," Patma-Banasirakan Handes 4 (1974). （アルメニア語） Հին Արտաշատ [Ancient Artashat]. Yerevan: Armenian Academy of Sciences, 1975. （フランス語） "Les fouilles d'Artaxata: Bilan Provisoire," Revue des Études Arméniennes 18 (1984), pp. 367–395. （アルメニア語） Yeremyan, Suren T. Հայաստանը ըստ «Աշխարհացույց»-ի Ashkharhatsuyts. Yerevan: Armenian Academy of Sciences, 1963.